Learn about our Heat Exchangers from Metglas®, Inc. The advent of Metglas Brazing Foils (MBF’s) from Metglas, Inc. enables cost-effective, reject-free production of stronger and more efficient corrosion resistant heat exchangers. This unique form of amorphous nickel-based brazing filler metal can substitute for previously used copper foil to braze stainless steel base metal. High strength and outstanding corrosion resistance of brazed joints are achieved when using our very own Metglas Brazing foils. Waste heat recovery systems are gaining popularity because of rising energy costs. This finned tube heat exchanger recovers the waste heat in steam for a Rankine cycle turbine. Fins must be brazed onto single-piece sections of tube up to 6m long. Approximately 220 km of tubing may be used in a single heat exchanger. High flexibility and the ability to resist tension and crushing during assembly are crucial. High strength, corrosion resistant joints with a uniform thickness are essential. Brazing filler metals in powder and powder-binder composite forms are poor candidates because of contaminating residues and possible joint shrinkage. Metglas Brazing Foils (MBF’s) offer the advantages of purity and consistent thickness allowing a fully automated process. Each tube is rotated to wrap it with foil and fin. The machine tensions brazing foil and fin stock as it turns the tube. The fins are crimped at one edge which is pressed tightly against the brazing foil. The assembly is then brazed in a pure argon continuous furnace at 1065°C for 10 minutes. High automation and low manufacturing cost are provided. High efficiency use in demanding installations where light weight and high performance are necessary, such as in aerospace applications. MBF’s foil thickness can be controlled to provide at least a 15% weight savings over comparable powder alloys. Without the binders or adhesives, the MBF’s joint is typically stronger than comparable powder, paste or tape joints by insuring clean and complete joint coverage. The ability to resist corrosion in deionized water, ammonia, and other harsh chemical systems while sustaining design pressures up to 1760 psi (120 bar). MBF’s series alloys are corrosion resistant to ammonia and other corrosive environments. 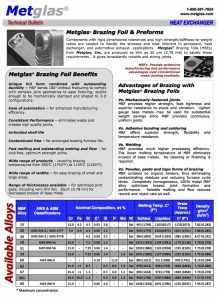 High resistance to sulfuric, phosphoric, and nitric acids make MBF’s foil an ideal brazing filler metal for joining austenitic stainless steels or nickel/cobalt-based superalloys.